Over 15,000 kilometres of coastline and breathtaking scenery of snow-capped mountains, awe-inspiring glaciers and crystal clear lakes are waiting to be explored on your New Zealand road trip. From short trips to longer self-drives, New Zealand campervan experiences cover every length and landscape. Explore some of New Zealand's best cycle trails while sampling the country's sights on route from Auckland to Queenstown in your Britz campervan with your Britz rental bikes on the back. From novice cyclist to expert, NZ Cycle Trails have a trail for you, while Britz provide the bikes. Discover the magical Waitomo Glowworm Caves, sample wine at Hawkes Bay, embark on a Wellington city tour and overnight in Nelson. Enjoy a spa day in Hanmer Springs and a leisurely drive to Queenstown. There are plenty of cycle experiences that bring your senses to life on your journey. Follow New Zealand's longest river on the 'Waikato River Trail'. Explore the river and coastal network of pathways on 'Hawkes Bay Trails' and panoramic views on the 'Great Taste Trail'. Soaring mountain peaks and alpine meadows await on the 'St James Cycle Trail' while you can indulge in some cheeky wine tasting along the 'Queensland Trail'. From Auckland to Queenstown, taste your way through three significant wine regions on the Classic New Zealand Wine Trail staying amongst the vines in four of the Winery Havens. Enjoy stunning scenery, beautiful forest parks and indulgent food experiences while driving your motorhome along the Pacific Coast Highway on the North Island. Stay overnight at Mercury Bay Estate, the north-most maui Winery Haven with stunning views over Mercury Bay. Visit Hawke's Bay and spend the night at Linden Estate. More than 40 vineyards are clustered around the river plains behind Hastings. On the South Island, the journey from Christchurch to Queenstown is a stunning trip through mountainous terrain. Cromwell is New Zealand's fastest growing wine region, known for its Pinot Noir; nearby Bannockburn is home to Carrick Wines. Sophisticated, scenic Queenstown is the adventure capital and a great place to source gourmet food and wine. A motorhome experience allows you to get up close and personal to nature and the environment. And it's a great way to meet people including other travellers or locals. 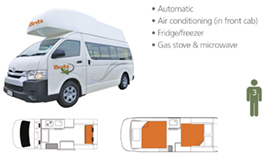 You will also save costs as you will selfcater in your motorhome with all the modern kitchen facilities. Campervans are designed for 2 to 6 people. Most are built on European chassis and generally come with automatic transmission making self-drive touring easy. All campervans come fully equipped with linen, towels, bedding, kitchen equipment, crockery and so forth. And for a small additional cost you can order picnic tables and chairs, a Holiday Grocery Box starter pack, Souvenir Road Atlas, baby seats if needed etc. In New Zealand taking care of the environment is a priority. To freedom camp in designated areas you need a fully self-contained campervan such as the options we offer. Alternatively we recommend staying at the Holiday Parks or Department of Conservation (DOC) sites. There are over 350 Holiday Parks (Caravan Parks) throughout the country which are safe, secure and comfortable with International standard facilities. Pre-booking is required only over peak periods but we have open dated vouchers available to pre-purchase. There are also over 200 Department of Conservation sites available throughout New Zealand. Facilities vary but are often quite basic and fees reflect this. We offer a 5 Day DOC Campsite Pass. To experience the real New Zealand, we have selected campervan partners who bring you more than just the camper. Indulge yourself with a stay at the Maui Winery Havens where you can stay amongst the vineyard overnight, cook up a sumptuous dinner made up of local foods and of course, sample the cellar door wine. 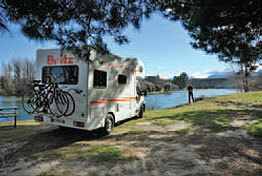 Or if you are into cycling, Britz Campervans offer bike racks and bike hire of Mountain bikes or Hybrid bikes. Britz is the official partner of the NZ Cycle Trails – 2500kms of cycle trails from the Top of the North Island to the bottom of the South. All cycle trails are clearly marked and have gradings from easy to advanced. 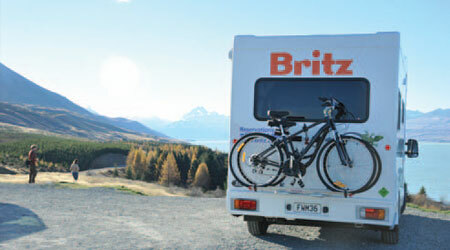 Britz has the largest fleet and widest range of campervans available, making it the perfect choice for a self-drive experience in New Zealand. Britz extensive fleet of 2, 4, and 6 berth campers will ensure there is a vehicle for all of your needs while on the road. With transport and accommodation all in one, a Britz Campervan holiday gives the freedom and flexibility to discover New Zealand at a pace that suits you. We strongly recommend you pre-book the great value-for-money ‘Britz Inclusive Pack’, which is only available in the UK prior to departure. • Express key return: – eliminates need for vehicle checks (only if Britz Inclusive Pack also purchased). *price may change with fuel price fluctuations. In order to remain competitive at all times, Britz operates a flexible approach to pricing known as ‘Flex Rates‘. These can be updated on a daily or weekly basis according to the simple laws of supply and demand. You‘re likely to pay more for the larger/most popular types of campervans during busy holiday periods, up to a maximum of £208 per vehicle, per day. During low season, however, you can pick up a campervan from as little as £14 per day! Generally, the rule is that the earlier you book, the more you will save – please ask us for a quote. 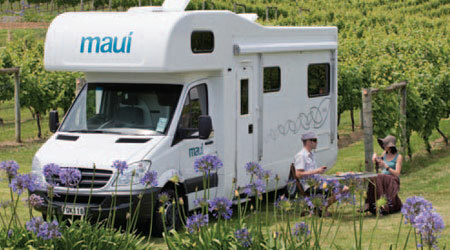 maui motorhomes are part of Australasia’s largest campervan company. Designed for apartment living on the road, a maui motorhome provides you with the room to live with style and comfort. There is a motorhome for even the most discerning traveller; offering ultimate space and design touches for a luxury camping experience. 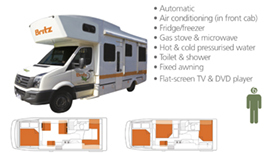 You’ll find your motorhome has apartment-style kitchen equipment and quality bedding and linen. You can also enjoy dedicated maui services including our complimentary valet service, linen swap and express return. With all vehicles featuring automatic transmission, maui motorhomes are a breeze to drive. Branches are conveniently situated at 3 locations around New Zealand. Plus there is always maui’s 24- hour on-road assistance if you need a helping hand along the way. 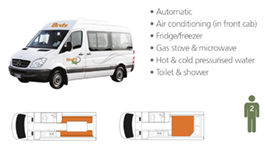 Choose from a large range of high quality motorhomes, sleeping from 2 to 6 people. Whatever your choice, you’ll experience apartment living on the road with comfort, space and style. (We strongly recommend you pre-book the great value-for-money ‘maui Inclusive Pack’, which is only available in the UK prior to departure. • Express key return: – eliminates need for vehicle checks (only if maui Inclusive Pack also purchased). Early Bird: An Earlybird Discount of 10% will apply to bookings made 120 days or more before travel date. This discount does not apply to the Maui Inclusive Pack. This discount can be combined with longer term hire discounts – please ask at time of booking. Waitomo, Ruakuri and Aranui Caves ‘Driver Goes Free: Upon presentation of a rental contract at the popular Waitomo Caves experiences, the vehicle driver will gain free access to the Waitomo Glowworm Caves when accompanied by one or more paying customers from the driving party.